We love to ship products globally! Here at www.KayakFishingSupplies.com, we ship via USPS Priority International and USPS Priority Mail. Priority International to all parts of the world and Priority Mail to Hawaii. In most cases, your international and Hawaii orders will require additional shipping charges. You will only be charged what it costs us to ship to your country. On average, it takes 8 to 10 business days for your order to arrive. You will receive tracking information via USPS. You are responsible for any customs due. Place your order. You will automatically be charged for domestic shipping (domestic means shipping within the United States). Note: you do not have to have a PayPal account to pay. You can use your credit card without creating the PayPal account. Pay the money request and we will ship your order ASAP! 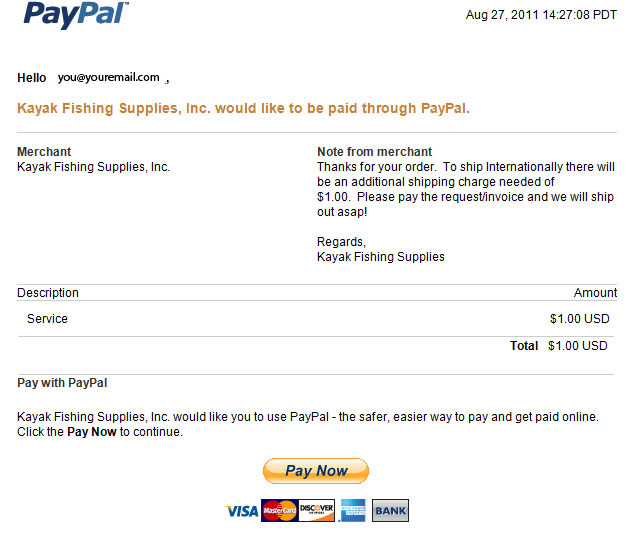 You can always e-mail us at info@kayakfishingsupplies.com for an international shipping quote. Shipping cost will vary depending on size and weight of the items you order. When inquiring about international shipping cost, please specify the items that you'd like to order and quantity of each, and specify the country it will be shipped to. We will email you the shipping quote.